Review: See No Evil 2 a Standard Slasher With.. Choice Cuts: Talking With the Soska Twins Abo.. Learn All About the Fleshing Knife in This Se.. 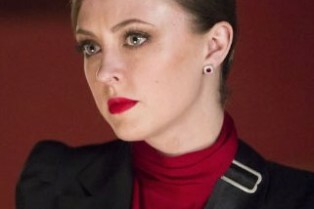 Shock Interview: Katharine Isabelle Talks Han..
Wrapping up our slate of Comic-Con interviews about See No Evil 2, I have for you stars Danielle Harris and Kaj-Erik Eriksen. Here, they talk about working with Jen and Sylvia Soska, how the tone compares to the 2006 film and they give you an idea as to who their characters are. The film hits DVD/Blu-ray/VOD October 17th. If you missed the trailer, watch it here. WWE and Lionsgate released the trailer for See No Evil 2 today, following a successful panel at Comic-Con last night. The film, directed by Jen and Sylvia Soska, hits DVD, Blu-ray and VOD on October 17th. He fell to his apparent demise from high atop the Blackwell Hotel in See No Evil, and this sequel picks up where the last one left off. With Jacob’s body lying on a cold sub-basement slab in the city morgue, Amy (Danielle Harris), a mortician, is surprised when a group of friends pay her a late-night visit for her birthday. But the surprise soon turns deadly when the psychopath everyone believed to be dead sets-out on a horrific killing spree, and Amy and her friends must do whatever it takes to survive. 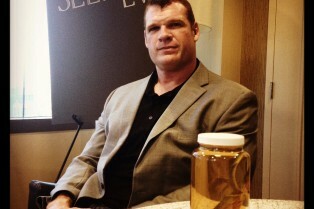 Shortly before speaking with Jen and Sylvia Soska, directors of the upcoming See No Evil 2, at Comic-Con I went one-on-one with Glenn Jacobs (aka “Kane”), the star of the 2006 film See No Evil and its follow-up. The actor/wrestler reprises his role as Jacob Goodnight, a massive brute who was last seen efficiently slaughtering a group of teens. In See No Evil 2, his supposedly dead body is transported to a morgue where he targets a young mortician and her group of friends. Danielle Harris, Katharine Isabelle and Kaj-Erik Eriksen star in this fall 2014 DVD/Blu-ray/VOD release. 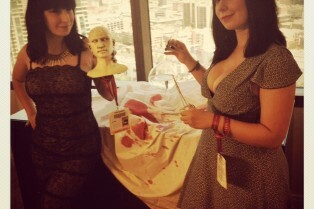 Comic-Con Interview: The Soska Twins Talk See No Evil 2! Comic-Con interviews are a funny thing. You’re not given enough time to get really deep with the interviewee about whatever film or product they’re promoting, so – for a guy like me – I’m left to merely do a “warm up” discussion that will only serve to preview a film and pave the way for a larger interview that will occur down the road. That said, I had five minutes to talk with Jen and Sylvia Soska of American Mary. This Canadian directing duo have leveled up and directed See No Evil 2 for WWE/Lionsgate which they’re pushing at the con. See No Evil 2, the sequel to the 2006 slasher film, is finally seeing its release. And, no surprise, Lionsgate Home Entertainment will bring it to DVD, Blu-ray and VOD this fall (no release date has been set). Directed by the team that brought us American Mary, Jen and Sylvia Soska (aka The Twisted Twins), the film finds WWE superstar “Kane” reprising his role as Jacob Goodnight. Who knew that See No Evil 2 would move this fast? Following last week’s news that Danielle Harris, Katharine Isabelle and Michael Eklund would join the cast comes word that Greyston Holt, Kaj Eriksen, Lee Majdoub and Chelan Simmons are also starring. Hear that noise? It’s the sound of thousands of male horror fans getting giddy over the fact that Danielle Harris and Katharine Isabelle are going to topline See No Evil 2 for The Soska Sisters. The Soskas, Jen and Sylvia, directed Isabelle in this year’s release American Mary (pictured). Harris and Isabelle will join go-to movie creep Michael Eklund (The Call) in the sequel to the WWE Studios production.